When you start using React with Rails, one of the frustrating problems you quickly run into is trying to access associated model data from your React component. In addition to the message body we also want to display the user's name. And that will just work even if you didn't include the user data in your database query in the controller. However, unlike in a Rails view, if we call message.user.name inside our React component without having specifically included that data in the prop sent to the component, it will throw an error. While a Rails template is actually able to call the model on-the-fly and get data it doesn't have, we don't have that luxury with React. 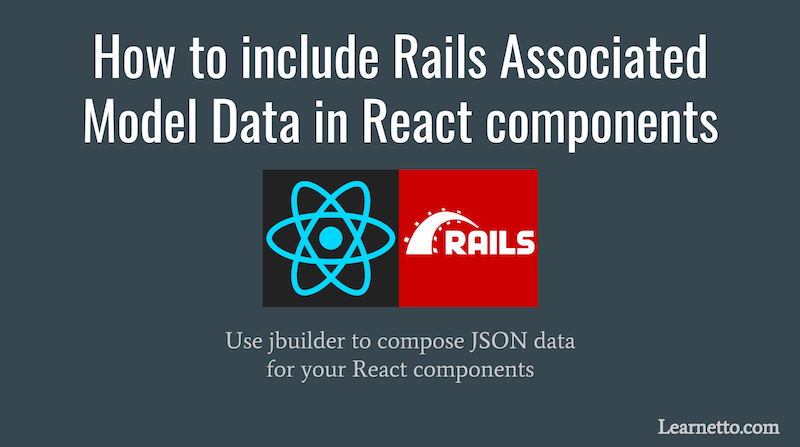 We need to explicitly compose the JSON with the associated User model data because a React component can only access the JSON data we provide it. There are many ways to include the associated model data, including manually composing the JSON in the controller, defining a custom as_json method on the model or using ActiveModelSerializers. One of the cleanest and most flexible ways is to use jbuilder, which gives you a simple DSL for declaring JSON structures. The jbuilder gem comes included with Rails. The jbuilder DSL is quite powerful and allows you to do all sorts of custom structuring of the data. Check out the jbuilder documentation to learn more about all its features. The full code of the Chat app is on Github and there's a live demo running here. You can also learn how to build it yourself in this two-part video tutorial - How to build a chat app with Rails 5.1 ActionCable and React.js Part 1 and Part 2.